I’ve been walking around in circles, trying to make sense of my dear friend’s so sudden passing. It was a brain aneurism. So quick. So final. So shocking. So unbelievable. So what does one do to try to heal the pain – for me, for her husband and for her children? I cooked. I did 3 loads of laundry. I baked 3 different kinds of Christmas cookies. My boys promised to help me put up the Christmas tree on Sunday. The older one arrived with a Santa hat and proceeded to make eggnog from scratch before taking a nap and then decorating the tree a little. His brother did more. Football was also a big component with everyone yelling for Tebow and then the Giants. But the eggnog was so, so delicious!! You take heavy cream, whole milk, egg yolks, vanilla, fresh nutmeg and cinnamon and beat it all up, add the bourbon, then whip the egg whites separately and fold in. I made a 3 course meal for my family on Sunday. Baby artichokes to start with a hot mustard mayo dipping sauce. Then I made a tandoori chicken recipe from a Weber Grill cookbook, with cous cous, a cucumber onion salad and steamed buttered carrots. The whole meal was really delicious but the chicken did not taste like tandoori chicken. It tasted like an interesting, Middle Eastern spiced chicken, but that’s about it. So I’ll just have to rename it to manage expectations, if I should make it again. 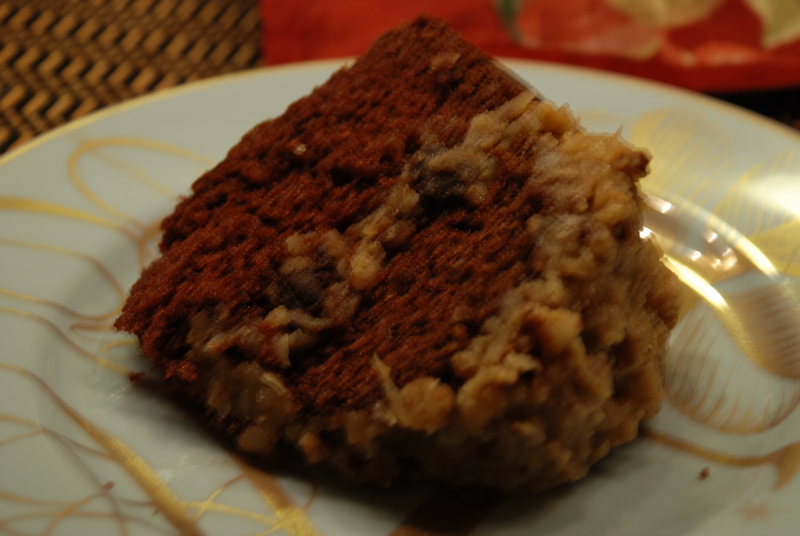 Then, for dessert, I made a German chocolate cake that was divine. I used a Duncan Hines boxed cake mix. I followed the directions exactly. I used my mother’s heavy duty bundt pan (my layer cake pans are at the country house so that was out) and really, this cake was spectacular. So light and fluffy – just a beautiful texture. I’m thinking it was this pan that made it so. However, I had to cut the thing in 2 layers to properly distribute the topping and it was so light, delicate and fresh, that it was a hard thing to do and in the end, it didn’t look so pretty. My mother would not have been proud. But it was yummy! My husband and Zach each had 2 pieces and and the older son took a big chunk home with him this morning. So here’s the recipe from my Mom for the topping that “makes” it a German chocolate cake! Sprinkling of fine sea salt on top at the very end. In a saucepan, combine the evaporated milk, sugar, egg yolks, butter and vanilla. Bring to a boil, lower heat and simmer strongly over medium heat for about 12 minutes until mixture thickens. Use a whisk to stir throughout this process. Remove from heat and add coconut, nuts and a sprinkling of fine sea salt. Beat until cool and thick enough to spread between 2 layer cakes and on the top. Do not ice the sides. After spreading the topping on the first layer, I sprinkled about 1/4 cup of semi-sweet chocolate chip pieces on top, before covering with the second layer. Just a little extra surprise touch that everyone loved! Thank you so much – I am crying. Every tear I ever cried, turned to pearl before it died. Every pain that in me burned, forged to wisdom I had learned. Be gentle with yourself. Cry. Each day will turn into the next. Your friends and family will be your soft place to fall. Your compassion is what makes you feel so much. Never lose it. You are in my thoughts and heart. You will feel peace again. 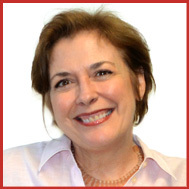 So sweet of you – and her name was Debra! Thank you again.